While it is always stressed that chilling glassware is an important step in making great drinks, how important is that to the end result? Moreover, some bars will cool their glassware in freezers while others will chill them with melting ice or ice water. While obviously the freezer is more optimal, how does that difference translate into the final drink temperature? To test that, I devised an experiment to address these questions using a Vodka "Martini" as a standard drink. • Measure room temperature and freezer temperature. • Chill 3 glasses in freezer for over 90 minutes. • Chill 3 glasses with ice cubes with some water. • Measure temperature of ice water before use. • Keep 3 glasses at room temperature. • Add 3 oz vodka and 4 ice cubes to cobbler shaker. Shake 30 seconds. • Double strain to remove ice shards. • Measure temperature every 30 seconds for 5 minutes while gently stirring with temperature probe. • Ice water dumped 15 seconds before straining. Glasses removed from freezer 15 seconds before straining. • Do a round of shaking to measure initial temperature before straining. • Yes, I shook a Vodka "Martini" but it is a quicker technique than stirring and is a consistent method. Moreover, taste and texture of the drink were unimportant here. • Different glass sizes and shapes will affect the end result. Here, the 9 glasses are comparable to each other, but not to other glasses. • Ice temperature (from freezer or wet ice) will affect results. • Room temperature will affect results. • Different drink compositions will change the amount of alcohol, sugar, and other solutes in the drink and may effect temperatures. • My thermometer was never calibrated. 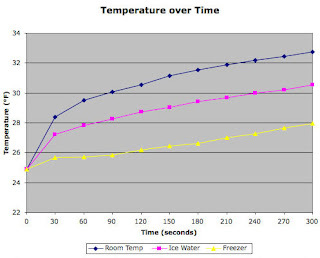 • Initial temperature (t=0) was only measured once as a separate experiment. Performing it for each run would have disrupted the experiment. This data point is only there as rough estimate for each trial's initial time point. • Glasses were not handled or drank from (which would otherwise normally happen). Initial temperature of the glassware before straining does effect the temperature of the drink. The freezer-chilled glassware provided the coldest drinking experience but only provided a drink that was 2.5°F colder than an ice water-chilled glass in this experiment. The freezer-chilled and ice water-chilled glassware were better than unchilled glassware by 4.4°F and 1.9°F, respectively, over the time course. The differences, however, were not as great in magnitude when the first sip might be taken (somewhere between 30-60 seconds after straining). Choice of glassware would matter greatly. In a cocktail glass, the stem and base do not play a large role, whereas in a rocks glass, the thick base would act as a large heat sink. Moreover, freezers will chill the whole glass whereas ice water will mainly chill the cocktail glass' bowl. 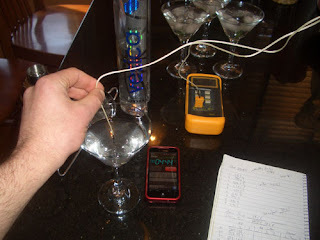 Future experiments could address these difference such as by measuring the temperature time courses of coupes and rocks glasses as well as different styles of cocktail glasses. So what does a 1, 2, or 4 degree difference mean to the perception of a drink? Obviously, this will vary by drink composition and some drinks will be only slightly less pleasant to drink warmer whereas others' balance will begin to crumble. Over the 5 minute time course, an unmolested drink changed about 3 degrees in this experiment. Perhaps making the same drink twice, strained 5 minutes apart and sampled simultaneously, would help to answer that. Devin, my laxness at chilling glasses at home (limited space in freezer for storing glassware, not to mention the joy of spontaneity of choosing which of our new or vintage glassware; limited ice production capabilities) was what made me wonder what was the effect and was what made me do the experiment in the first place. This is why drinking in Boston is the best -- only here would we do this. Also another reason why this is and drinkboston are the only cocktail sites a boy needs. I wonder how different glassware would affect the warming curve. For instance, would thicker glass slow the warming? And if so, would a frozen thick glass bend the curve down more than an ice water chilled one? I imagine that a frozen thick glass would make the slope closer to horizontal and a warm thick one would make the slope more vertical. Also, an unchilled glass in the summer (no A/C) or in a crowded, hot establishment will have a more vertical warming curve than the one I presented (beside all curves tending in that direction, albeit to a lesser extent). If you're really comparing glass type to glass type, you'd have to assess weight of the bowl (glass minus stem and base). Destructive would be my first instinct, but we can learn from Archimedes and use water displacement instead (of a fully submerged versus partially submerged glass). I love that you took the time to do this. My question is this though: When you shorten the time the glass spends in the freezer, how does it compare? At one bar I frequent, they go through a remarkable number of glasses; on a busy night, it is not uncommon to see the dishwasher run, emptied into the freezer, and a glass from that run used within 10 or 15 minutes. What sort of effect does the freezer have versus ice water when you are looking at starting with a hot glass and can only freeze it for 15 minutes? I have no clue how long it would take to cool a glass. It would depend on how hot the glasses are going in and how many times the freezer door is opened (and the cold air exits).